Last night’s election had a nation in shock. That much is obvious. Conservative supporters would have been overcome with joy, everyone else would have been devastated. For weeks, everyone, from casual voters to political experts, had been convinced we were heading for another hung parliament – with both Labour and The Conservatives head-to-head. However, the exit polls released at 10pm last night completely defied these projections – where they had the Conservatives expecting 316 seats (8 short of forming a government), while Labour were predicted a comparatively measly 239 seats – less than what they gained in Gordon Brown’s highly unpopular campaign in 2010. Eventually, The Conservatives manage to defy predictions even further, and formed a majority government this time, with 331 seats! There are many possibilities to explain what could be behind this astonishing difference between the polls and the actual outcome. Some might even suspect foul play i.e. fixing the amount of votes received. Personally, I believe that a combination of Tory media + the polls being manipulated to say the two parties are equal, would create a sense of urgency for the gullible to vote Conservative – a ploy by The Tories to remove any doubt that they would gain power. However, let us not get into a long investigation about these possibilities. This is not the purpose of this article. Either way, we are stuck with this government now, so it’s much more necessary to figure out what they could do – and more importantly, how we can deal with it. First of all – Scotland. The English political parties endured near wipe-out at the hands of the rampant SNP. No doubt, with much Nationalism embedded in Scottish society – as a result of the uprising of the Scottish National Party, there will be even more desire for independence than last year’s referendum. Of course this will play into The Conservatives hands. They were the ones that pushed Scotland towards a referendum in 2014. If Scotland are independent, that will greatly diminish Labour’s chances of gaining power again; one, because Labour has always relied on Scotland in the past to build a stronghold of seats in elections; two, Labour would not be able to form any kind of coalition with the Scottish Nationals, something which is almost vital for them to form a strong government. So, expect to see more talk of Scottish independence in the near future. Their next step is to cut welfare. 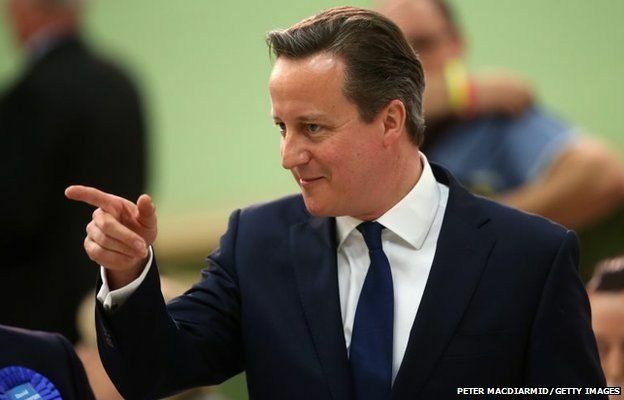 The Tories have proposed devastating cuts – £12 billion of welfare spending is to be cut. The most vulnerable and needy will be hit hard by this. Food bank usage will soar, and suicides will most likely increase even more. They will justify this by perpetuating that many people on benefits are scrounging them and are on them due to sheer laziness. As a very small percentage of people claiming some kind of benefit actually claim it fraudulently – they will be unethically taking welfare from those who are in dire need. Sadly, many people do buy onto this stigma – hence the need for them to vote Tory! In recent weeks, there has been much speculation that the Conservatives would increase university tuition fees to £11,500. Even if this is simply idle speculation, the fact they are not even considering lowering the fees from their current rate of £9,000 per year shows their apathy towards helping those from less privileged backgrounds. Of course, as long as students from upper class backgrounds can gain access to their chosen universities easily, then the Tories will not be losing too much sleep over this. One issue which is haunting many people is the prospect of an EU referendum, which looks poised to happen in 2017. Many people do hold mixed opinions about this. Of course, the idea of isolating ourselves from the rest of the continent under a Conservative rule may not seem like a pleasant scenario to many – however, only 35% people claim they would like to leave the EU according to a YouGov poll. So, if you are worried about the idea of leaving the EU, then don’t panic! It does not seem completely bleak just yet. Unless the Conservatives really wanted to, then they could attempt to brainwash the public into believing the EU is bad – something you must remain vigilant to! The NHS is likely to be top of the public’s concerns. With this in mind, I bring grave news to the reader. Remember in the past couple of months, there has been much media coverage of Jeremy Clarkson? Well, this couldn’t have come at a better time for The Tories. While this was going on, The Conservatives signed the largest ever privatisation deal for the NHS – worth £780 million. Of course, this was when they were being slightly held back by their coalition partners – The Liberal Democrats. As we have just entered a new government with a pure Conservative leadership, it is deeply unsettling to think about how they will treat our beloved National Health Service. Now to a more serious issue. One which I consider to be a more sinister and harmful one. One that truly is a plague and a hindrance to a happy, equal society. Tax evasion. The Conservative Party have made no mention of removing the current non-domicile rules, and other regulations which allow tax evasion to be a major issue. According to a report by the Public and Commercial Services union (a union for most staff at HMRC), the tax gap was an estimated £119.4 billion at the end of 2014. Imagine what could be done with this money if it was put in the public spending pool! Not to mention other money that could be made from setting more appropriate tax rates for the rich. In regards to the above point – George Osborne claims that his austerity policy is necessary to balance the books and make up for the damage that Labour has caused. The latter of these two reasons is often used as an excuse to make cutbacks, so that in reality The Conservatives can hoard up much more wealth for themselves – and to make the economic figures look good. This tactic would actually slow economic growth, but the Tories don’t care – it is still simply another trick to keep the poor in line. Unfortunately, many people do not question this – in fact, many of their working class voters do not question their clear lack of intention to increase the minimum wage. 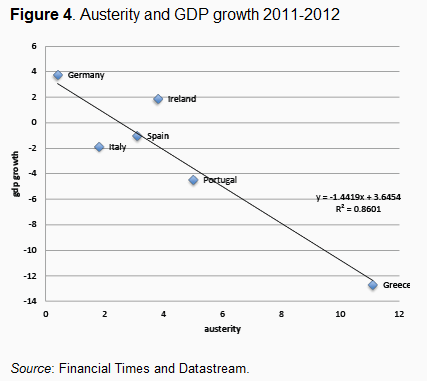 The graph above shows a clear correlation between austerity and economic growth. It appears that, the more austere a country is, the less economic growth it has. Poking a huge whole in George Osbourne’s policy, and strongly suggesting that he is making cutbacks for other intentions than the ones he so frequently states. With all of this in mind, it is evident that the Conservatives aren’t really this stable, honest party for the workers and the general public that they have portrayed themselves to be in their pre-election campaign. No. They truly are a self-serving party who’s main priority is to keep themselves and their rich friends wealthy, and to keep the poor as quiet, obedient, and unquestioning members of society. It will not be a pleasant five years for some – especially those that need help the most. So I urge the reader – please, do not buy into the Conservatives lies about how austerity and cutbacks are necessary, as they will use this to secure a foundation of future conservative voters – which will keep them in power longer. Thatcher did the exact same thing, implementing a free market policy – which would later secure a “me me me” type of society – or in other words, a larger net of conservative voters. Do not fall for the stigma perpetuated by them about ‘welfare scroungers’ , immigrants or any other kind of demonizing of the vulnerable/poor. This type of tactic is an old one, used by oligarchy-type governments in the past, and it has even been used by this current one – the main aim is to turn the vast majority against each other, so they are distracted from what the government and the corporations are planning to do behind people’s backs. Also, many of the most popular newspapers such as The Sun, The Daily Mail and The Daily Telegraph support the Conservatives and in the past they have deliberately mislead their unassuming audiences. With a Conservative majority government, this will likely go on even further. I urge the reader now to take what they read in these papers with a pinch of salt – or even better, boycott them completely. Treat your fellow human being with compassion – especially those who are going to be affected worse by the cuts, for they need it the most – and form a unity with those around you. This will go against what the Conservative party wants – they want the poor to fight against each other. If the public directed their attention to what the government will be doing, rather than falling for scapegoating which as directed at each other, then this could keep the insidious Conservative Party at bay. If people realised the Conservative’s true aims, this awareness could create frustration among the public, which would lead to them being kicked out in the next election – for the long term good of the country. Previous Post Are Labour really responsible for the recession and the rising national debt?